Call little crossbill, lost on the winter gale; though your flock is gone. Punctuate every furlong with your merry voice. For if I can hear you as you wing, there is hope your fellows might too. “Red Crossbill” ©Jacob S. Spendelow. Used with permission. Recently I experienced an uncommon sighting of a red crossbill. Uncommon bird sightings aren’t actually that uncommon during regional high winds or storms, yet it still felt a treat to be reacquainted with one of my favorite rufous little finches. It quickly became apparent that the fellow was lost and separated from his flock. There wasn’t even a sign of the mixed species flocks that sometimes form during winters. The buffeted crossbill began to call for his companions, and words filled my mind. A wish to encourage him touched me, even though I try to observe behaviors with detached objectivity. Of course the best I could do was chase him to a higher branch so cats wouldn’t be tempted by the attention he drew to himself. Forgive me for being sentimental this time. 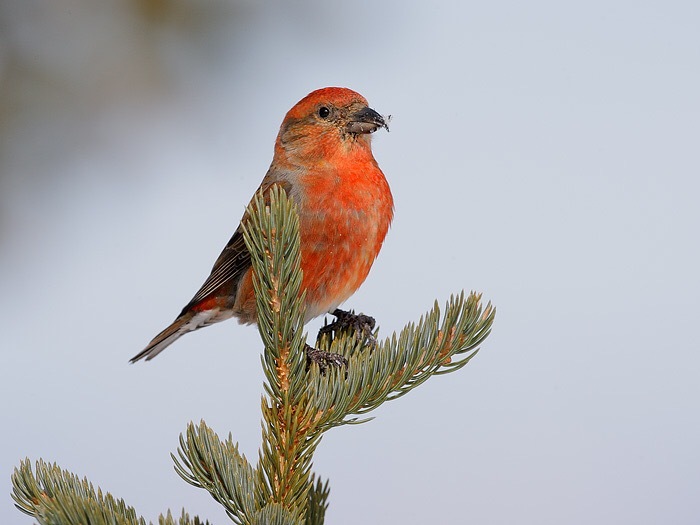 Click here for more information about red crossbills. The sounds I heard were the call, not the song, which you can listen to thanks to Cornell Labs.